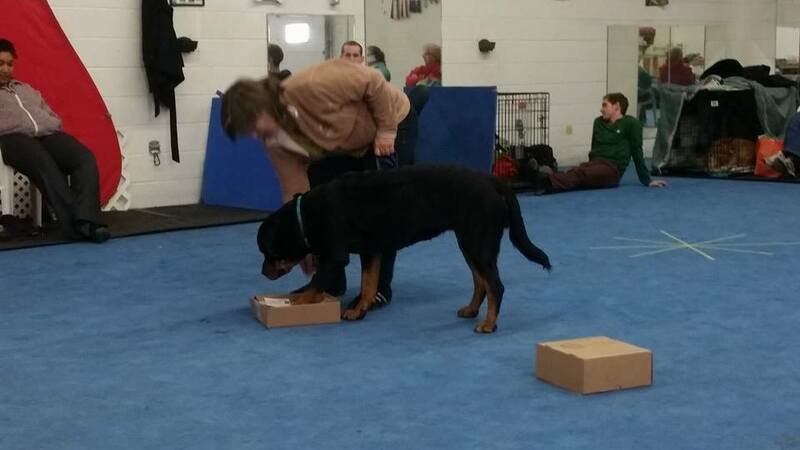 This past Saturday Carlie and I participated in a workshop in canine nosework/scenting. The day once again provided me with opportunities to reflect upon key dynamics, skills and behaviours needed to succeed in love and partnership, to succeed in relationship well-being. Throughout the workshop we learned how to positively and respectfully reinforce our dogs to ‘find’ the scent of wintergreen and then reward them for making choices to find this ‘stinky scent’ (not a natural scent they might naturally gravitate toward!). But more importantly, we were asking them to choose to ‘play’ with us. We started out by making the criteria very simple. Treats in one hand. Wintergreen in the other. Choosing to smell the wintergreen always resulted in a treat on top of the little bottle of wintergreen, communicating that ‘yes’ we want you to choose to scent this oil. Respectfully, we invited our dogs to play with us by using good enthusiasm, partnership, and clear communication. Each time Carlie chose to smell the wintergreen I cheered her on and gave her a treat on the container. I consistently affirmed and reinforced the behaviour we were seeking with each attempt she made. 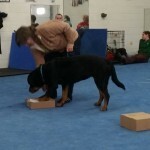 Because we were in a workshop setting, each training session advanced the criteria, (so we could understand the process), but were clearly told not to go to the next level until the dog had shown good consistency, confidence and accuracy in the foundational skills. In the actual sport test, handlers are not given any information about which box holds the scent. Only the dogs are to track the scent. The foundation skills build that kind of clarity of expectation and partnership for the ultimate game. What we want in this game is their participation to scent out what we ask of them, but we need to trust that their nose is much more accurate than ours. Each human-dog partnership had multiple opportunities to receive individual coaching to improve our movements (and intention behind our movements) to better communicate what we wished to communicate. Often it was such little movements like having the shoulder the wrong way, changing our walking pace, or looking at the dog rather than the target that only confused rather than helped the dog. Speak simply and respectfully (cues need to be a word or two). Be clear in the outcome. What is the end result and what does it look like? Be clear in what I’m asking her to do in each training session (can I explain it to myself in 5-7 words or less). If I can’t make it simple, how can I expect to create little steps and help her to be successful? Be consistent – with my encouragement, with my cues, with the progression towards advancing the skills, etc. – so it remains clear for Carlie. Remember that we are both learning to work together, so practise the foundation steps well and build trust in our partnership in this new sport. These might seem like simple and common sense behaviours and knowledge you regularly practise with those around you. And yet, how often do our intentions, our criteria, our outcomes, our posture and behaviours (ie. eye movements, shoulder position, head position, etc) actually all align? Ask yourself what vision and behaviours of love and connection you need to get clear about so those who matter to you understand what you are asking of them and what you wish to offer to them. Take the necessary time to build trust and establish a solid foundation. It may seem slower at the beginning, but front-end loading is always worth the effort when stress hits! A really useful tool I have developed to help you clarify what you want to do differently this year and accomplish in peaceful relating is Wisdom’s Way to Relating Peacefully: Your 2015 Working Guide. You can find it on my website or at my office. Do what it takes this year to show yourself and others you love them. You will bring peace to us and our world. For me, the nosework/scenting workshop was a beautiful opportunity to practise mindfulness of love in how I partner with Carlie in ‘new territory’, in an old conversation (one of trust and partnership) as it occurs in a new context, in a new form, for a different outcome/game. I invite you to practise mindfulness of love with someone near and dear to you as well.